Thermo solar energy is harnessed by solar collectors allowing home owners to generate hot water with the rays of the sun. The collection of thermo solar energy has evolved with the invention of the evacuated tube solar collector. This multi-walled glass tube, with a vacuum between the layers, as well as a special coating that traps the heat, allows a high temperature to be generated internally generating steam in a copper tube which is passed to a circulating fluid via a manifold and ultimately to a hot water tank which provides hot water to the home. 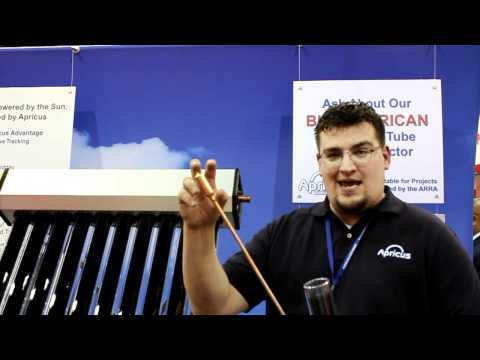 Adam Bailey of Apricus, a manufactuer of solar hot water systems, explains how evacuated tubes are used to capture thermo solar energy at the 2011 AHR Expo in Las Vegas.